Rain will be possible on Monday and especially Tuesday, followed by cooler temperatures more typical of fall. Our extended stretch of dry, very warm weather had to end eventually. Now, as the calendar flips from September to October, the weather is finally getting back to normal. First will be something we have seen very little of since early July: rain. 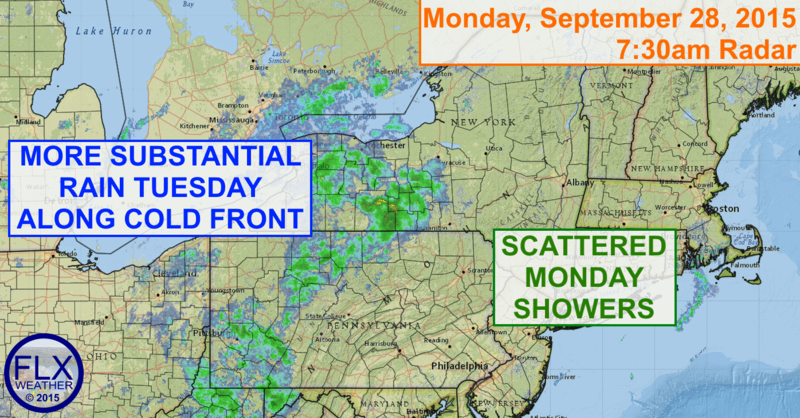 A disturbance moving through on Monday will bring mostly light, scattered showers to the area, but a better chance for some substantial rain will move in on Tuesday along a cold front. In particular, the later half of Tuesday looks wet as the cold front interacts with temperatures that will still be in the upper 60s and 70s along with a flow of moisture from the Gulf of Mexico. Widespread rain is expected by the late afternoon and evening hours, continuing into the overnight. The rain will not be excessive, but some areas could see over an inch, which would certainly be beneficial. A few showers may linger early Wednesday, but for the most part, the Finger Lakes should dry out for the remainder of the work-week. Temperatures will be much cooler, with highs struggling to get much past 60 degrees Wednesday, Thursday and Friday. While Wednesday night may still have some clouds around to keep nighttime temperatures up, Thursday Night will probably end up clear and quite cold, with 40s and perhaps some 30s for lows Friday morning. The weekend’s weather is uncertain at this point, but even cooler temperatures are likely. I do remain optimistic that warmer weather will return, at least for a couple days, towards the middle or end of next week.